know endlessly, and never require. In this series of posts I'll review three recent, and surprisingly readable books that explore an critical emerging movement in philosophy called object oriented ontology (OOO): "ontology" because it theorizes the nature of being, "object-oriented" because it does not privilege human being above or beyond any other kinds of being: potted plants, grasshoppers, fishhooks, mathematical formulas, love, etc. Despite the obvious fact that things are things in themselves not merely things for us, this is not usually how we interact with them. What is labeled important is whatever counts to human perception and human interest. But, what would it look like if we actually recognized the legitimate and inscrutable existence of things apart from ourselves? How would this alter how we interact with each other and with the planet? "Weakness" is a term that Tim Morton uses in his most recent book Hyperobjects: Philosophy and Ecology After the End of the World. "Weakness" is the fact that for humans, or any other observing subject, the appearance of something can never capture the entirety of that object. There is a "radical split between the object and its appearance for some other entity." Although this has always been the case, it is only recently, with the appearance of vast, ungraspable objects like global warming and radioactive waste, objects, which will shape and are shaping not only our present day experience, but also the far-flung future, that humans have been forced to acknowledge this truth. Humans, like all objects, are "lame"--fragile entities that operate with limited and incomplete knowledge of others and ourselves. Morton references the delightful animated short Das Rad which shows us the world according to two piles of rocks. Because objects' being "withdraws" from analysis, Morton, a professor and Rita Shea Guffey Chair in English at Rice university, wisely eschews writing in an academic "metalanguage" which would pretend to exist entirely apart from him and the objects he is considering. This is not to say that Morton is unfamiliar with philosophy (cogent references to Hegel, Heidegger, Deleuze, Derrida, etc., pepper the book,) nor that he subscribes to the postmodernist idea that everything is merely a metaphor. Morton is quite aware that reality remains. The polar ice cap is melting and this will materially affect life on Earth whether or not we choose to believe in it. Just as the appearance of an object is a translation of an object's being into what an other perceives, metaphor, too, is a translation. But, just as some poems are more affecting than others, some metaphors get at the weirdness of being more than others. Morton offers an impressive assortment of these drawn from quantum physics, art, poetry, Buddhist thought, music, and his own quotidian personal experiences. Failing to offer a definitive logic, his arguments are marked by an admirable "lameness." Nevertheless, if the reader is willing to follow, by the end of the book she will find herself in a very different, and very unsettling place: somewhere at the end of the world. 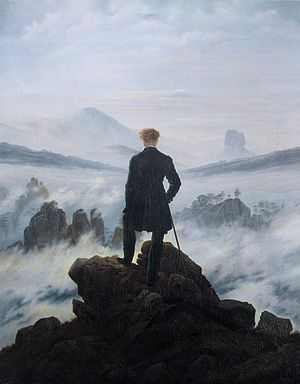 For Morton, Caspar David Friedrich's Wanderer Above the Sea of Fog exemplifies the romantic fantasy of an idealized, foregrounded space from which to contemplate "Nature." Morton argues that the end of the world has already happened. It began in April 1784 with the advent of the steam engine. Although, "world" like "nature" is merely a concept that reflects our mostly ineffectual attempts to fix in place the true strangeness of reality, with this invention, humans became a "geophysical force on a planetary scale." Morton likens an object's appearance to rhetoric, a form of persuasion that involves both delivery and reception. What hyperobjects persuade us of is the end of a finite, human-centered "world." Not only do they force us to recognize the nonhuman that we live in and around and which live in us, they force us to recognize that in such a mesh of interaction, there is no "safe" distance. What Morton calls "hypocrisy" is just this refusal to recognize this. Hypocrisy is our ability to imagine some pure, transcendental space and fantasize that we have access to it, rather than admit that there are objects that determine our fate that are so alien, that we can barely perceive them, let alone relate to them ironically. Michael Madsen's documentary Into Eternity about the Onkalo waste repository at the Olkiluoto Nuclear Power Plant is addressed to an audience thousands of years in the future who will still be dealing with the radioactive waste we produce today. By separating his arguments into two parts, Morton loosely recapitulates the divided being of objects. In Part 1, he describes "being for itself," the general qualities of hyperobjects. Since, even with massive objects, being retreats, these qualities are not essences but "incompletely defined potentialities that are developed when it (an object) interacts with an appropriate system." Using examples primarily drawn from quantum mechanics, Morton shows how a sincere appreciation of hyperobjects alters conventional human conceptions of time and space, self and other, causality and appearance, and consciousness itself. Having shattered the reader's world in Part 1, in Part 2, Morton examines how we ought to respond to the destruction of our cozy perceptions. He chastens us to note that "all those apocalyptic narratives of doom about 'the end of the world' are...part of the problem, not part of the solution," since they only serve to maintain the finite human conception of a world. Using examples drawn primarily from music and visual art, he comes to a startling conclusion. What is left of a world without "world" is a constant state of intimacy in which we can begin to recognize and value the ways that nonhumans interact with and leave their traces upon us. Every object, no matter how small, emits a zone of forces. Being self-centered, we do not see this. Instead, we mistake the source of our own actions, the coming together of innumerable causes and conditions, to be purely free will. It is not just hyperobjects that point this out: art and music, beauty, and the sublime do it, too. Think of being speechless before a particularly gorgeous sunset and the reader will understand what Morton means when he states, "The zone vibrates from an object and burns through my conceptual overlay, haunting me with its strange strangeness. The zone turns my beliefs and reifications to ash." "Mesocosm (Wink, TX)" (2012) by Marina Zurkow from bitforms gallery on Vimeo. Morton uses Marina Zurkow's Mesocosm (Wink, TX) (2012)as an example of art that alters our perception of "Nature." 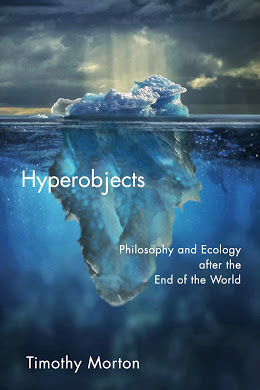 Morton suggests that hyperobjects, massively distributed in time and space, encourage us to develop a theory of ethics that transcends usual theories of self-interest. Such an ethics will necessarily and radically alter how we conceptualize the self whose limited interests we are now protecting. How else to decide what to do with plutonium waste that will still be around 24,000 years from now? Ecological awareness forces us to recognize the intractable interconnectedness of things. Giving the example of mitochondrial DNA, the working remains of symbiotic bacteria, Morton suggests that the encapsulated view of humans, is just wrong, for "to a great extent others are us." Jennifer Baichwal's documentary Manufactured Landscapes about the work of photographer Edward Burtynsky opens with a mind-blowing tracking shot of a seemingly endless factory floor in China where thousands of humans work producing the world's iron. Since we never experience any object directly or in its entirety, we will "always be wrong." What this means for ethics, is not that we curl up in a corner, or continue to delude ourselves with thoughts that there is some special, pure space, "God" or "science" or "Nature" where the messiness, incompleteness, and weakness of our knowledge and power can be completely removed or doesn't matter. Similarly, there is no place so far away, so small or so big, e.g. at the level of the atom or at the level of the Earth as a whole, where hypocrisy, lameness and weakness do not operate. Rather than grieve over the realization that we are not supermen, we ought to embrace the fact that by recognizing our own weakness, our finititude, we open ourselves to resonance with an infinite variety of other that we can never fully know let alone command. So, what to do? In place of idealism, Morton makes a plea for non-cynical incremental action, precaution and a commitment to contemplation whether this is in the form of philosophy or art or meditation. Certainly this response will not satisfy those readers looking for the big answer, the final number, but for those who approach with an open mind, the end of the world may be the very thing that saves us. Here is my interview with Tim Morton on technology, political action, and art. PHILADELPHIA AREA readers, please join me Wednesday November 12th at Temple University Tyler School of Art. I'll be speaking as part of the Critical Dialogue series on "Digital Literature and the Art of Failure."